The Nigerian Railway Corporation (NRC) says the construction of the Lagos-Ibadan Standard Rail Gauge has started fully as the challenges of underground pipelines and cables have been resolved. 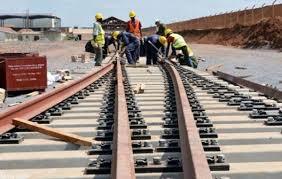 Jerry Oche, Lagos District Manager of NRC, told journalists in Lagos that work had started on the laying of standard rail gauge from the Lagos axis. “We all know that the standard gauge in Lagos axis from Apapa to Ijoko in Ogun is in the same corridor with narrow gauge. “Now, so far so good, the government is serious about delivering the project at the scheduled time and there is increase in pace of work along the Lagos axis. “But all have been resolved now and work has started wholly in the axis,’’ he said. According to him, water pipelines, cables and other installations underground of public utilities have posed great challenge to the execution of the work in Lagos. The NRC district manager said that some of the railway staff quarters were also affected by the construction. He said that the corporation had paid the affected staff members a year’s accommodation rent to secure alternative accommodations pending when the new quarters constructed for them would be completed.